Terrific Tuesday is here again, which means that I get to show you my project for One Crazy Stamper, and this month's Anything Goes challenge is so much fun to play along with. This card was actually suppose to be for next months challenge theme ( and no I am not telling you what is, but maybe you can guess ), but while coloring on Friday night with my coloring buddies, I realized just how many stamps I have waiting to be colored yet, so I just had to share with you! Isn't she just the cutest!!! This is "Kisses", a delightful image from Penny Black and the talented artist Mo Manning!! I stamped her with Tuxedo Black Memento ink on Copic Xpress It cardstock, and then colored her with Copic Sketch Markers. After fussy cutting her ( which I seem to do an awful lot of ), she is pop dotted on to the card front that I created using a Martha Stewart punch around the page border punch, and dp from Authentique's Lovely collection. Don't you just want to lean down and receive a big wet kiss from this little sweetheart. If you haven't popped on over to the One Crazy Stamper challenge blog, please take a few minutes to visit the wonderful design teams creations, then get creative, and enter to win an awesome prize by following the Anything Goes challenge theme. That image always makes me smile, and you colouring is just so gorgeous! I love your papers, too, they really 'pop'! Darling card! Your coloring is very very good. I am excited to be on the design team with you! Anxious to get to know you! Shari this is so amazingly adorable!! Your coloring is stunning! This does just wanna make you pucker up - LOL! 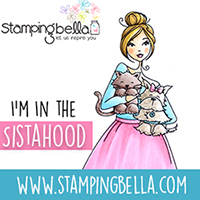 Thank you so much for playing along with us at Loves Rubberstamps this week! Good job with the fussy cutting. Thanks for sharing at LRS. What a fabulous card, love the colouring and all the details! Love that image as well! Thanks for playing with us at Loves Rubberstamps! Shari, This is so cute... Love the image and how you made her pop. 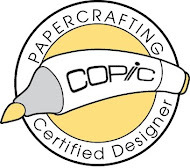 Thank you so much for playing along with us here at Loves Rubber Stamps.